It is with great sadness that we inform all of our colleagues, friends and associates that Jan Øivind Moskaug passed away on Friday, May 11, 2018, after battling cancer for a year. 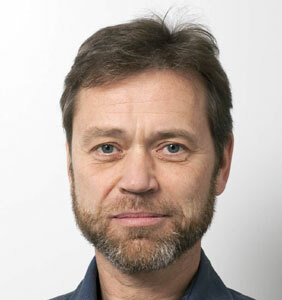 Jan Øivind was a group leader at the Stem Cell Center from its inception in 2009. He was actively pursuing the role of mesenchymal stem cells in modulating inflammation in animal models and their utilization for tissue reconstruction in clinical trials. He was a devoted teacher, and a clear voice for responsible and ethical practice in scientific research. He will be sorely missed. Adipose stem cells are interesting both in relation to human pandemic obesity and as dispensible source of multipotent mesenchymal stem cells in regenerative medicine. Our laboratory is interested in elucidating functional aspects of adipose stem cells in mice, with particular emphasis on their function after tissue implantation. Our research group consists of 1 post. doc and 1 Ph.D. student dedicated to understand how adult stem cells may influence inflammatory processes in mice. We combine animal disease models in transgenic mice with state-of-art in vivo imaging of labelled stem cells to address these issues. The long-term goal of our work is to understand how mesenchymal stem cells might influence disease progression when transplanted into dysfunctional tissues. A secondary goal is to characterize conditions of nutritional relevance that influence differentiation potential, first in vitro and secondly in vivo. To reach this goal, we are (i) establishing protocols for multimodal optical imaging of stem cells in inflammatory animal models, and (ii) systematically varying adipose stem cells culture condition with respect to critical components to assess consequences for their immun modulatory activies. Development of protocols for adipose stem cell imaging in vivo. This project includes generation of luminescent and fluorescent reporters, either constitutively or differentially expressed. Genetic labelling of cells is complemented with labeling with magnetic and fluorescent beads compatible with MR imaging. Optical and magnetic imaging modalities is compared regarding signal intensity, S/N ratios, tissue compatibility, resolution and duration. Immuno modulatory activities of adipose stem cells. This project investigates factors released by adipose stem cells that modulate NF-kB responses in macrophages with possible consequences for the immuno regulatory functions of mesenchynal stem cells in vivo. Nutritional factors influencing adipose stem cell diffenetiation and function. Adipocyte differentiation is studied in vitro as a function of carbohydrate and fatty acid availablility. Prof. Helga Refsum and prof. Hilde Nebb, Institute of Basic Medical Sciences, Department of Nutrition, Univeristy of Oslo, Norway: Cystein metabolism and adipose stem cell differentiation. Prof. Philippe Collas, Institute of Basic Medical Sciences, Department of Nutrition, Univeristy of Oslo, Norway: Epigenetic profiling of mouse adipose stem cells. Prof. Joel Glover, Institute of Basic Medical Sciences, Department of Physiology, Univeristy of Oslo, Norway: Imaging modalities for stem cell tracking and localization. Non-invasive in vivo imaging of protein kinase A activity. Moskaug JØ, Carlsen H, Blomhoff R.Mol Imaging. 2008 Jan-Feb;7(1):35-41. In vivo imaging of NF-kappa B activity. Carlsen H, Moskaug JØ, Fromm SH, Blomhoff R. J Immunol. 2002 Feb 1;168(3):1441-6. In vivo imaging of NF-kappa B activity. J Immunol. 2002 Feb 1;168(3):1441-6. Polyphenols and glutathione synthesis regulation. Moskaug JØ, Carlsen H, Myhrstad MC, Blomhoff R. Am J Clin Nutr. 2005 Jan;81(1 Suppl):277S-283S. Review. Identification of endogenous retinoids, enzymes, binding proteins, and receptors during early postimplantation development in mouse: important role of retinal dehydrogenase type 2 in synthesis of all-trans-retinoic acid. Ulven SM, Gundersen TE, Weedon MS, Landaas VO, Sakhi AK, Fromm SH, Geronimo BA, Moskaug JO, Blomhoff R. Dev Biol. 2000 Apr 15;220(2):379-91. Christensen EI, Moskaug JO, Vorum H, Jacobsen C, Gundersen TE, Nykjaer A, Blomhoff R, Willnow TE, Moestrup SK. J Am Soc Nephrol. 1999 Apr;10(4):685-95.